That’s why those who want to deep dive into DApps here is a detailed guide on: What are DApps (Decentralized Applications)? – The Beginner’s Guide. Many DApps will be successful and will have mainstream use cases, hence the idea of introducing you to some of the DApps that are doing very today seems like a good one. Ethlance is like Upwork – a marketplace for jobs. 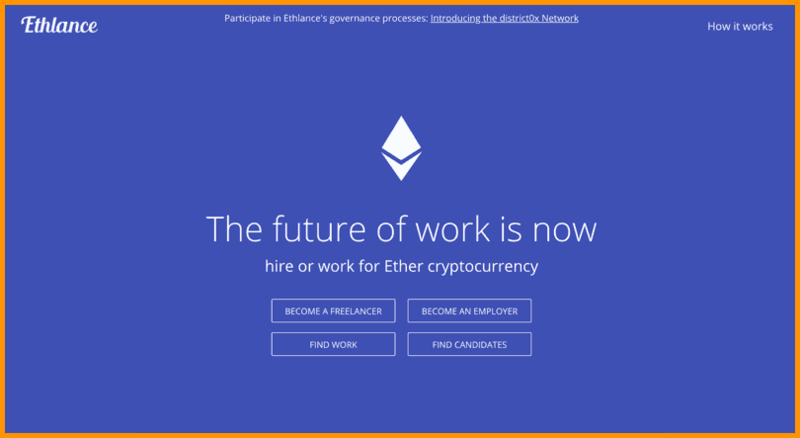 However, unlike Upwork, Ethlance is a decentralized marketplace for job postings and hiring freelancers hosted on the Ethereum blockchain. What makes it more interesting and transparent is that it charges no registration fee or contractual work commission as it is totally decentralized. The platform can sustainably run with 0% service fee as is clear from the fact that it never takes a cut from transactions between freelancers and employers. 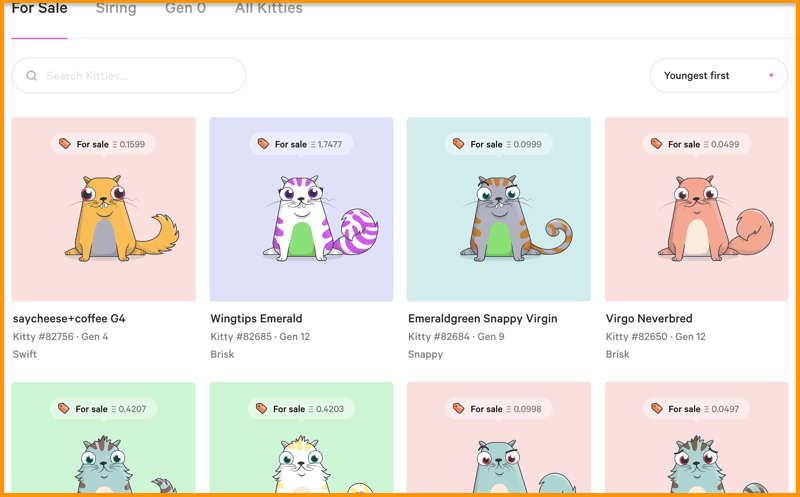 CryptoKitties is a new game or app that gives its users access to digital cats which they can buy, sell or breed. These cats or kitties are called cryptocollectibles. The CryptoKitties app, a blockchain powered game, is also hosted on the Ethereum blockchain. Aragon is a very interesting and special project on Ethereum blockchain. It is a platform or a DApp to build and manage decentralized autonomous organizations popularly known as DAOs. The DAO concept can be applied to any organization, company, non-profit or foundation, to bring an extra level of transparency as well as more effective governance of these entities. It also helps in curbing unnecessary intermediaries which can be replaced by governable ethereum smart contracts. The Aragon platform is powered by its native token ANT which can be bought on Bittrex if you believe in the project’s future. uPort is an identity management platform powered by the Ethereum blockchain. 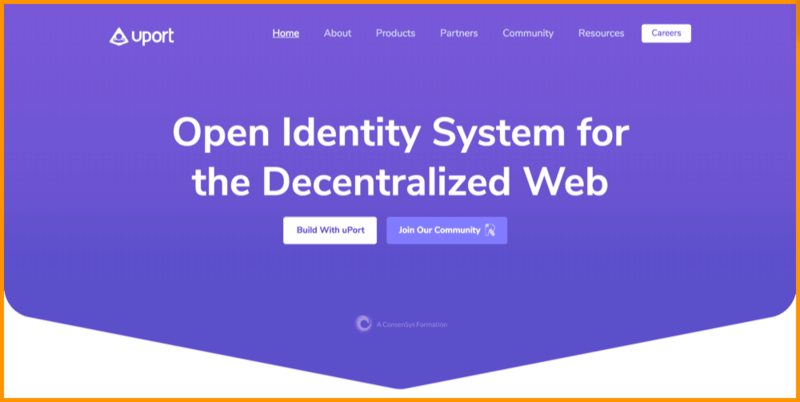 It is a ConsenSys-backed project that aims to streamline digital identity with an aim to stop identity and data theft. It considers your mobile as the extension of your own self and when you configure your uPort for the first time, it fetches data from your mobile with your permission and writes in Ethereum’s smart contract which can later be shared by the users as and when required. It does not have a native token currently but it may be a possibility in the near future. The Gnosis DApp is in its beta phase but can be used for predictions. Gnosis is a platform hosted on Ethereum network and is designed to work as a prediction market. For example, let us say you want to know the market prediction of a football match or an exclusive international auction. Here, Gnosis can help you find out the answers to difficult questions as well as help in price discovery. It has its native token GNO that lets you vote and is available on Bittrex. 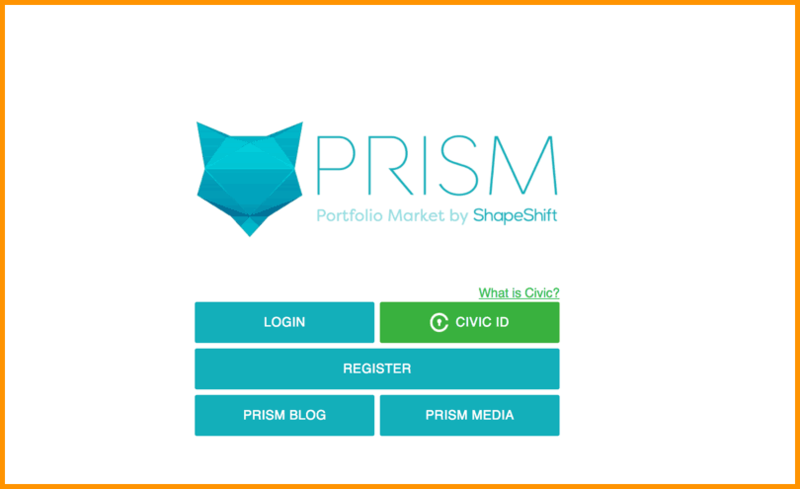 Prism is a decentralized and trustless asset portfolio market by ShapeShift hosted on the Ethereum blockchain. Through Prism, one can invest ETH in different cryptocurrencies and specify their percentage of holdings they want. And as it is based on Ethereum smart contracts, one need not manage passwords or seeds of several exchanges or wallets to manage their crypto portfolios. It also shows your investment portfolio in a great UI and automatically tracks it in real time. The Prism DApp is in the beta stage currently. Radex is a zero-fee decentralized exchange for Ethereum tokens (ERC20) and an exchange for the ERC223 token standard. Radex is the first exchange to adopt the Saturn protocol, a decentralized exchange DAO (decentralized autonomous organization) for all EVM blockchains. 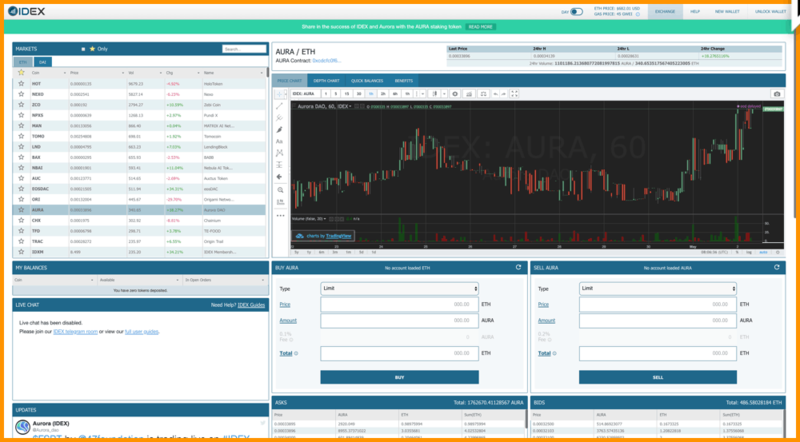 IDEX is another decentralized exchange or a DApp on Ethereum network. Here, you can buy, sell and store Ether and ERC20 tokens on IDEX. To me, it looks much better than EtherDelta which is another DEX DApp. You can also use IDEX with MetMask or Ledger Nano S like wallets to further strengthen your security while using this exchange. Note: While you register on IDEX don’t ever forget to keep your back phrase/password/private keys safe because that is the only thing that will help you restore your funds. Golem is the Airbnb of computers. Through the Golem platform or DApp, one can harness the computing power of other computers that are situated far from us and even lend our computing power to someone who is need of extra computing power. You can think of it as a decentralized supercomputer or a marketplace where you can buy or sell the extra computing power you have. Golem supercomputers will run when the user pays in GNT native tokens. 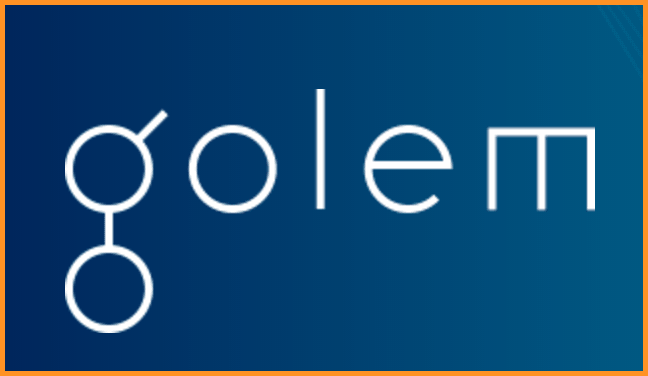 These tokens will be given to people who have rented out their extra computing power on the Golem network. The project is in its beta phase and LIVE on the Ethereum mainnet so if you wish to buy some GNT you can do so on Bittrex. To keep an eye on other notable Ethereum DApps, you should bookmark CoinSutra and State Of DApps. 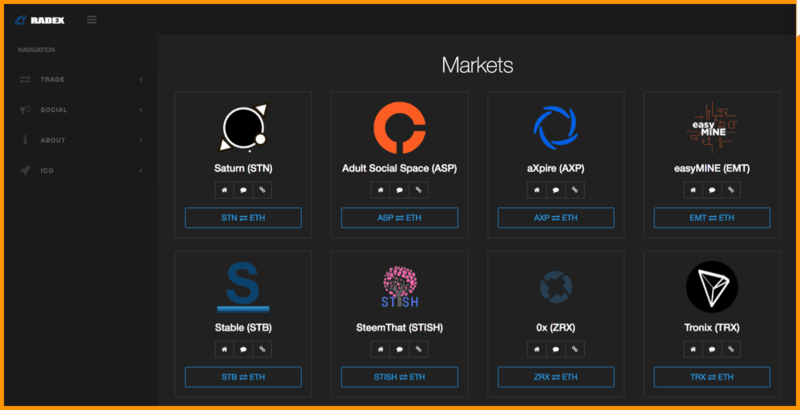 These were some of the notable DApps in the Ethereum ecosystem that I like the most. Now its time to hear from you: Which DApps do you like the most? Have I missed any good DApp? Do let me know using the comment section below. Hi Sudhir, Love your work & commitment keeping us all up to date in cryptoland. Just wondering if you could do a write up about “Digibyte” & your thoughts on it?